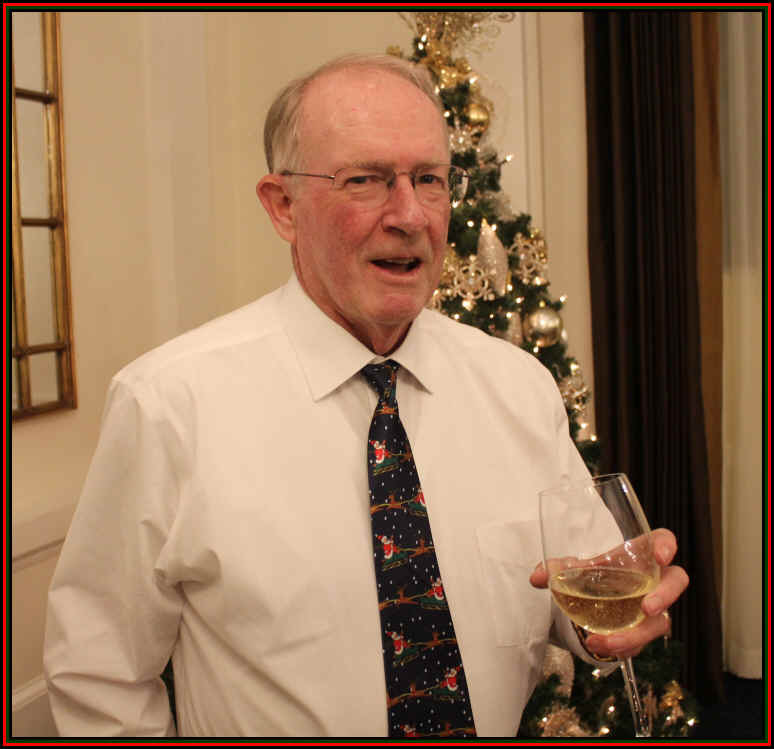 The 2017 Vino Fino Holiday event was bittersweet, marked by remembrances of members whom we lost this past year. 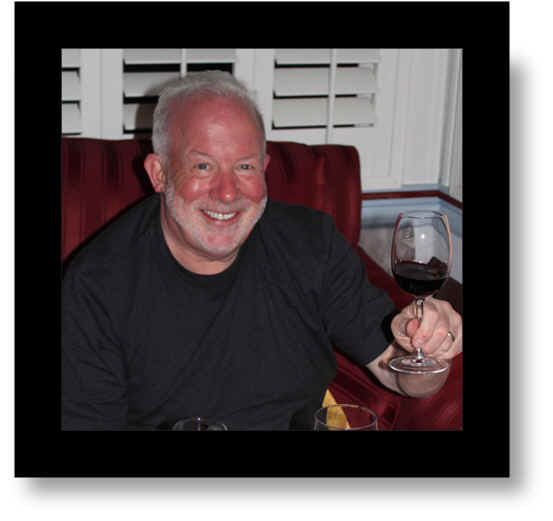 Dave Greiner passed away in July of this year. 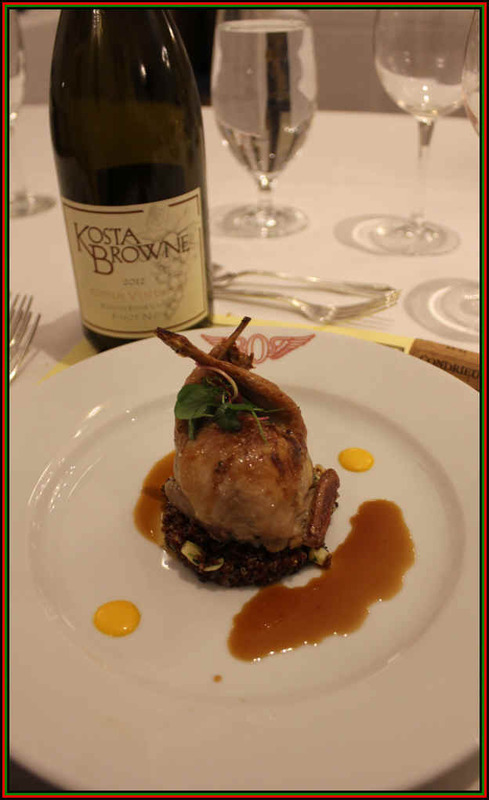 We decanted the various bottles of wine brought by Vino Fino members to pair with the dinner at San Francisco's Olympic Club. 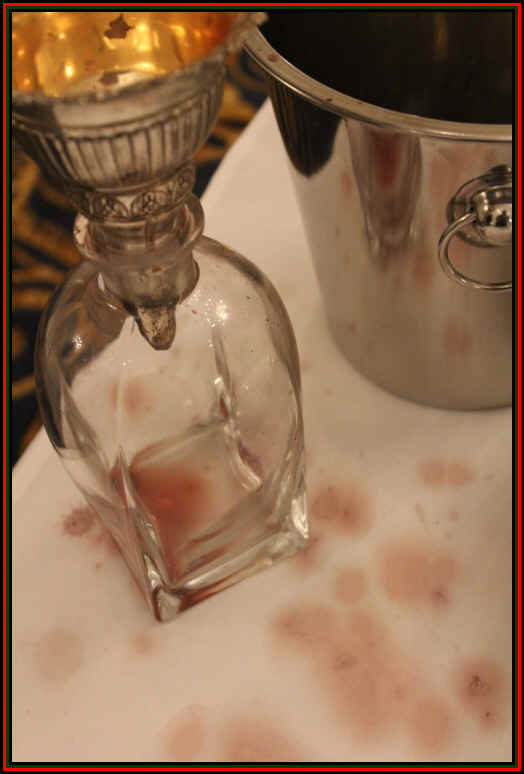 These bottles are "double decanted," first from the bottle into a decanter and then, once the bottle has been rinsed and cleaned of its sediment, back into the original bottle. Though we try to be neat about this, inevitably, there's a mess of a battlefield. 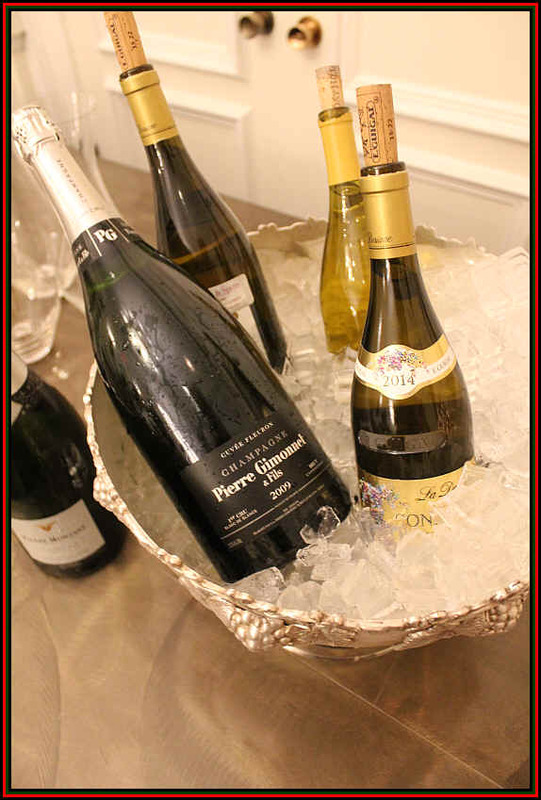 We had all the bottles double-decanted and were ready for the games to begin. 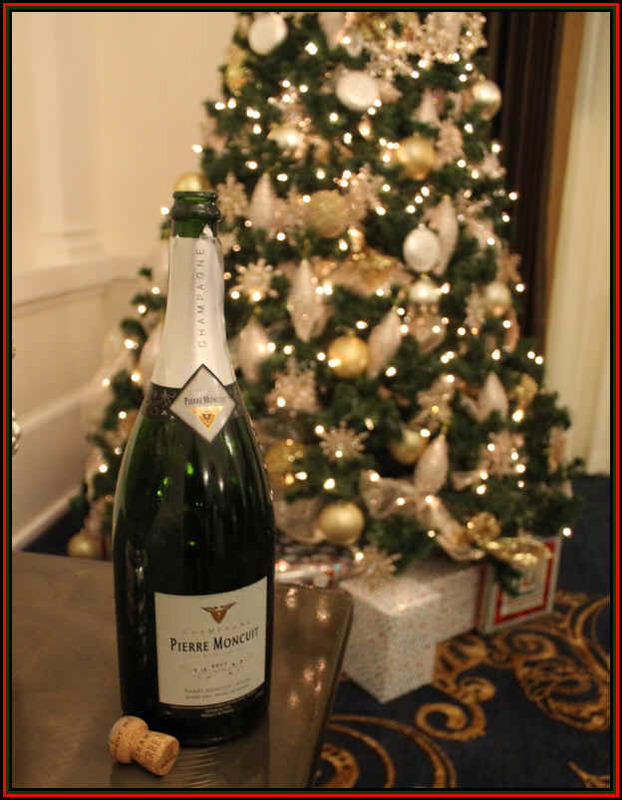 This is made entirely of Chardonnay grown in Les Mesnil, a grand cru site in the Champagne region. It's quite dry and bracingly crisp...perfect with the Oysters and Prawns. 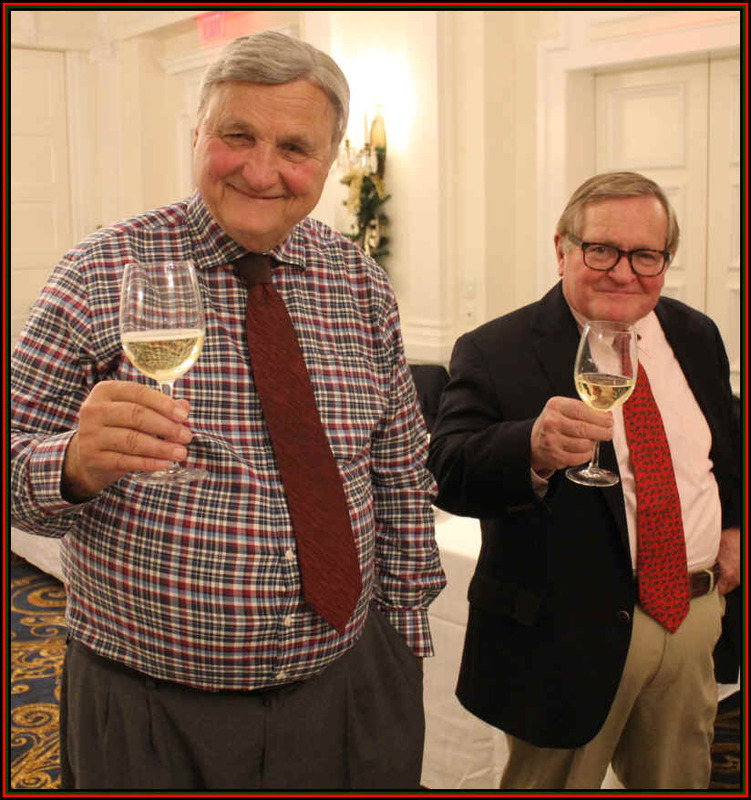 The dapper John McGlothlin said a few words about our late Vino Fino prankster John Vignau. 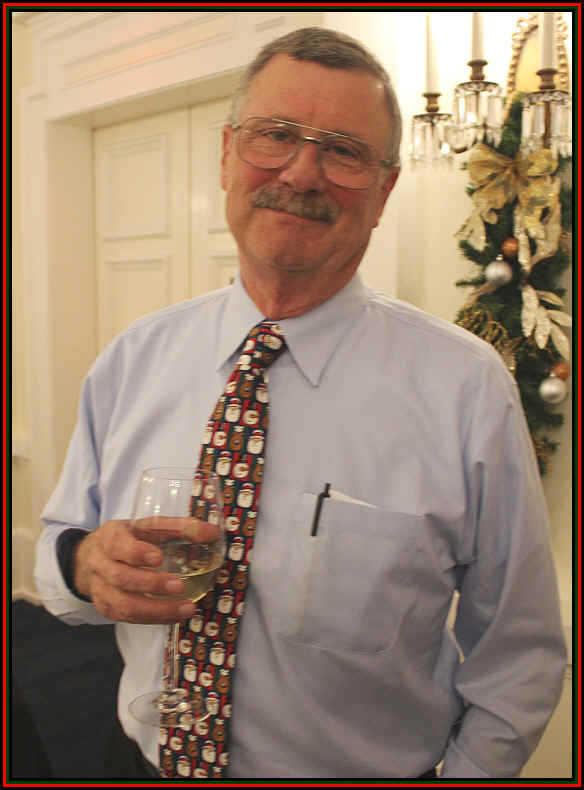 Mark Naismith gave an impassioned speech about the Vino Fino members whom we lost this year (and earlier). 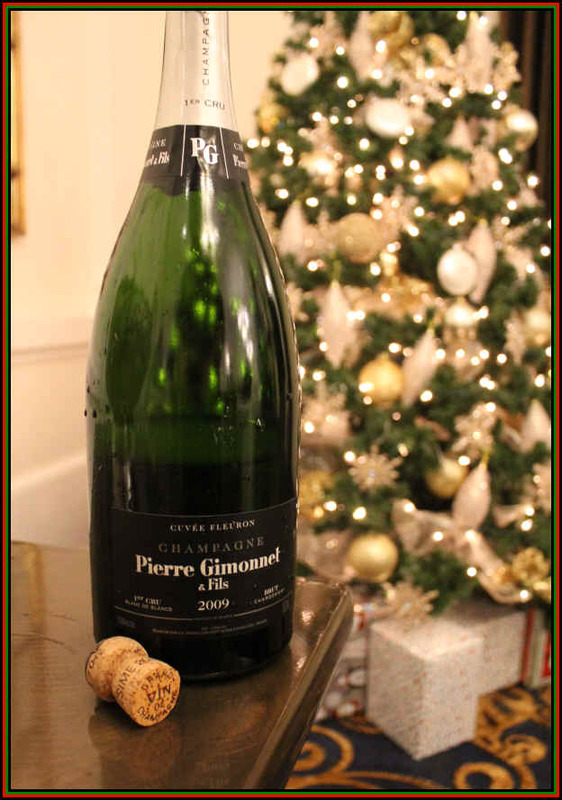 The second magnum of bubbles was then uncorked and this Cuv�e Fleuron by Pierre Gimonnet was delicious, too. 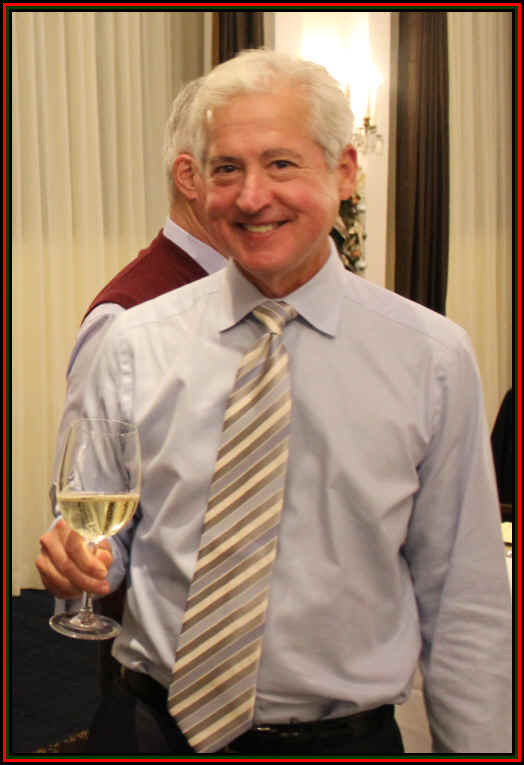 It's entirely Chardonnay and mostly from Grand Cru sites with a modest fraction coming from the Premier Cru village of Cuis (with grand cru wines from Chouilly, Cramant and Oger accounting for 81.5% of the blend). It's undergone a malolactic fermentation and the wine is quite dry and a bit fuller in body and somewhat more profound than the Moncuit. 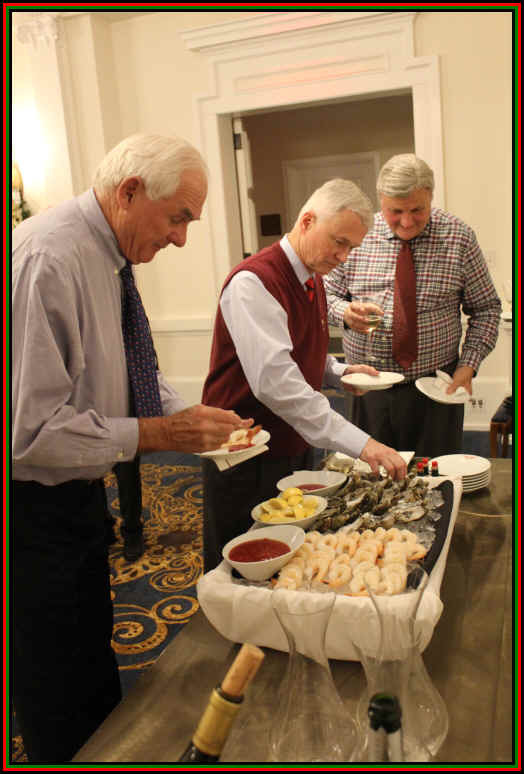 With that, people dug in to the little seafood buffet. 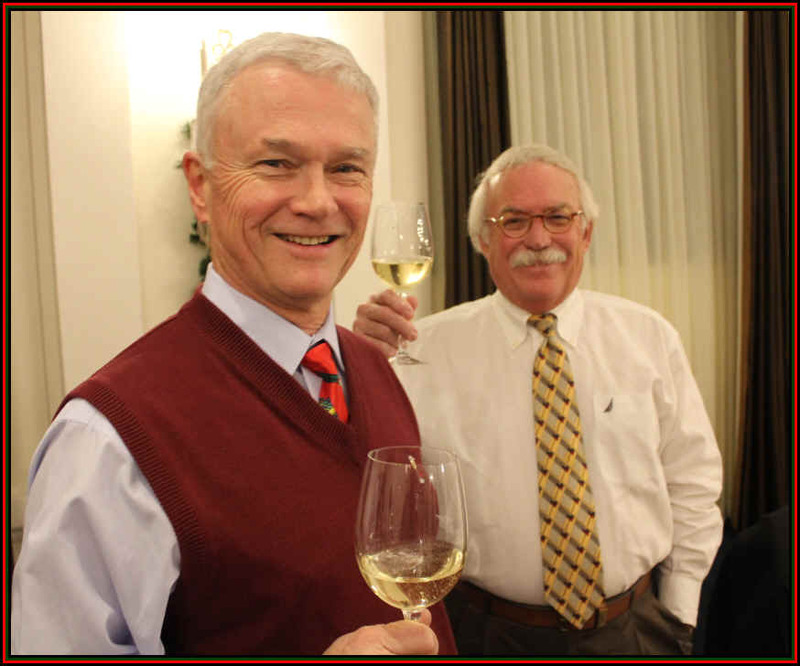 We poured some "Memorial" bottles to toast the former members of our tasting group. 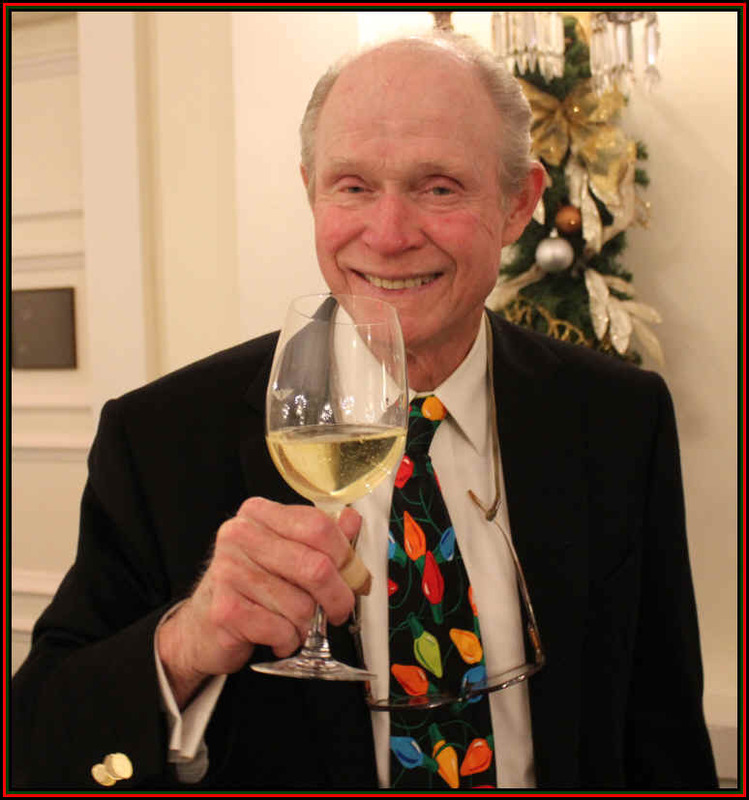 John McGlothlin brought a 2006 Stony Hill Chardonnay in honor of John Vignau. The nose of the wine was quite good...lots of fruit and a mildly appley character. Notes of pear and ripe melon, too. Dry...medium bodied...not "Burgundian," but quite nice. 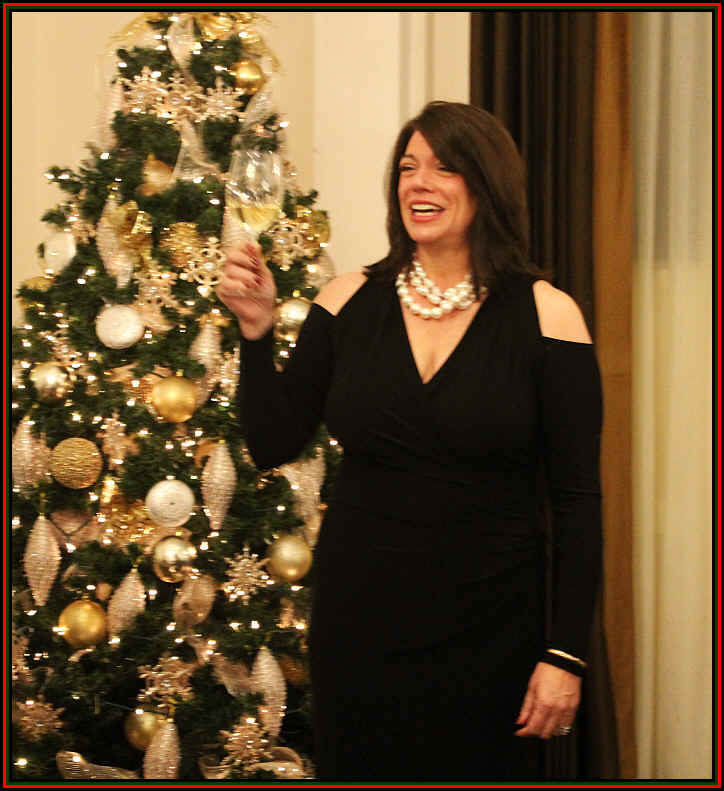 Stacey brought a Ch�teau Poujeaux from the 1996 vintage, a little Bordeaux Pat had stored in the cellar. 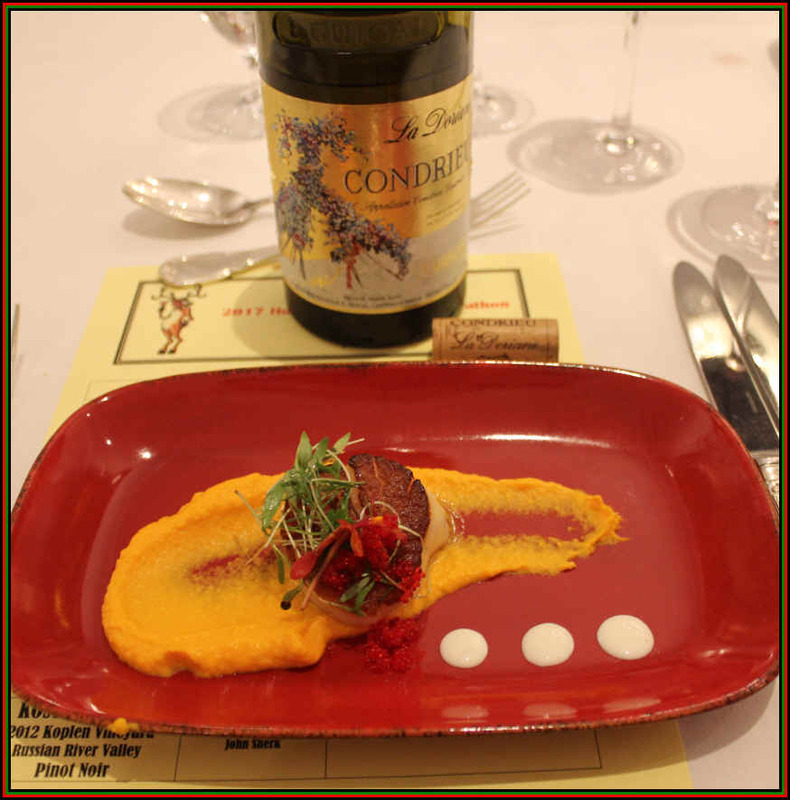 It displayed some tobacco notes and character consistent with it being a 20+ year old Cabernet-based red from the Medoc. There was even a touch of tannin remaining. 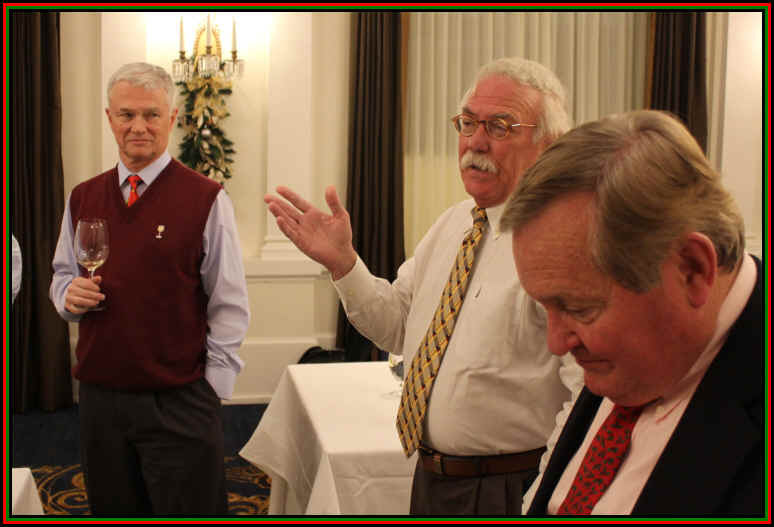 Ernie Anderson offered a "David Greiner Memorial Bottle." 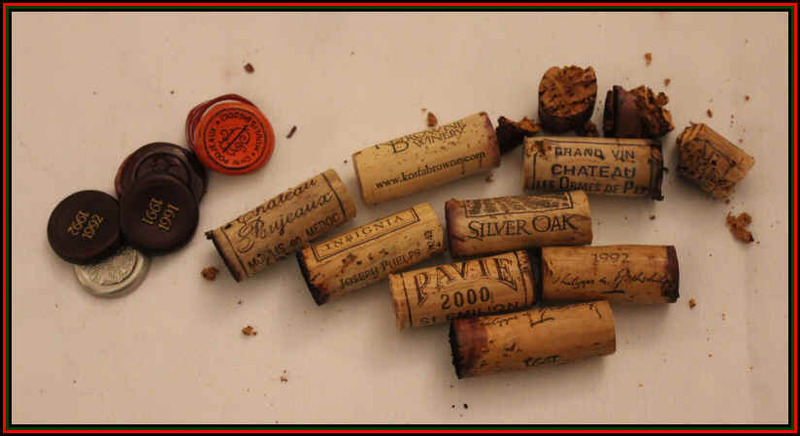 This was a 2000 vintage of Ch�teau Pavie, a Saint Emilion of note. This was a monster! Never mind that it's 17+ years of age, this is a baby! Inky black in color, it's very concentrated and intense...lots of black fruit notes...nicely oaked, too. Very showy, if a bit unusual in its intensity. The Guigal "La Doriane" Condrieu was quite good, but having been in the ice a bit too long, this took a while to warm and blossom...but when it did this was outstanding. 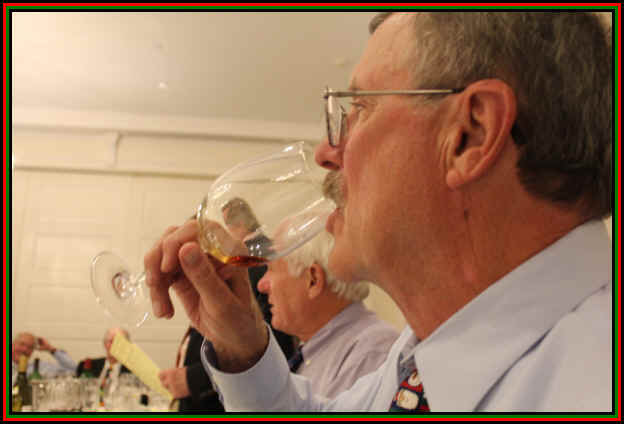 Lots of peachy notes and some sweet, toasty, vanillin oak...very complex. 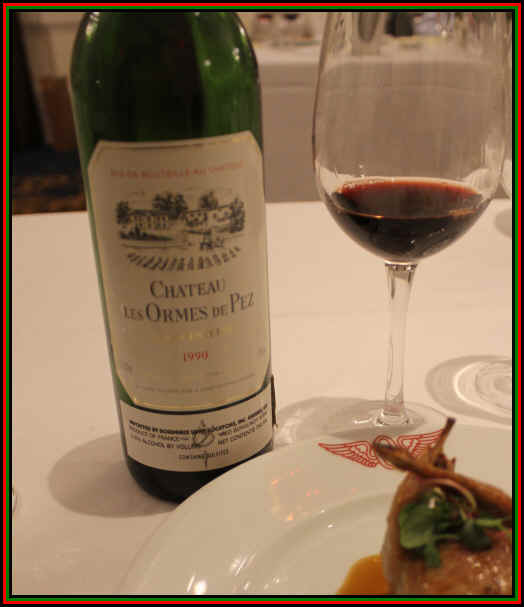 We then embarked on a Cabernet journey, beginning with A 1990 Ch�teau Les Ormes de Pez. This is an easy and simple Bordeaux...fully evolved and quite at its peak. A 2008 vintage of Silver Oak's Alexander Valley Cabernet came next...classic Silver Oak...lots of woodsy notes from the American oak barrels...young and full-throttle...very good. 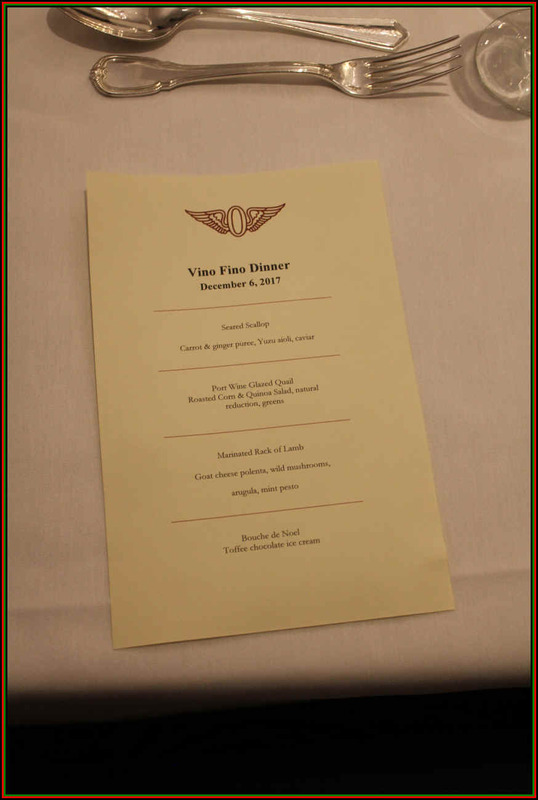 We had two vintages of Opus One...1992 came first. It began with a mildly herbal note...fairly smooth and then it veered off into a slightly horsy character coming through on the palate. The 1991 Opus was brighter and more elegant. Classic. 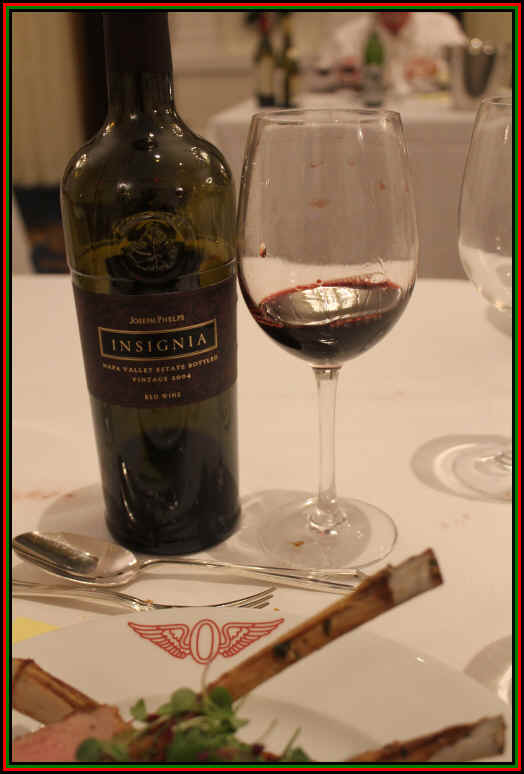 A 2004 Phelps Insignia was very fine...woodsy, dark fruit...some sweet tones and it had some depth and length. Still young, but developing handsomely...it has some life to it, so it can probably go another 10+ years, well-stored. 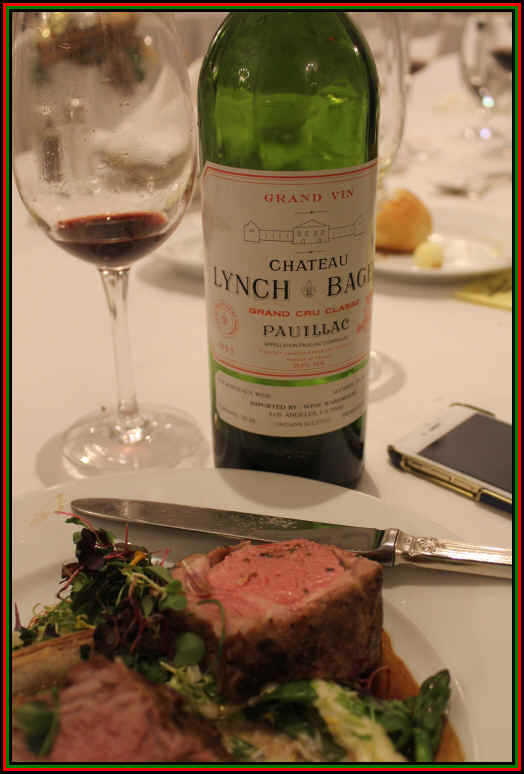 The 1995 Ch�teau Lynch Bages was showing well, a bottle from the cellar of the late Pat Donahue. Nicely developed nose with good bottle bouquet, there's a mild cassis note to its fragrance and on the palate. Medium bodied and with light tannins...Quite good. 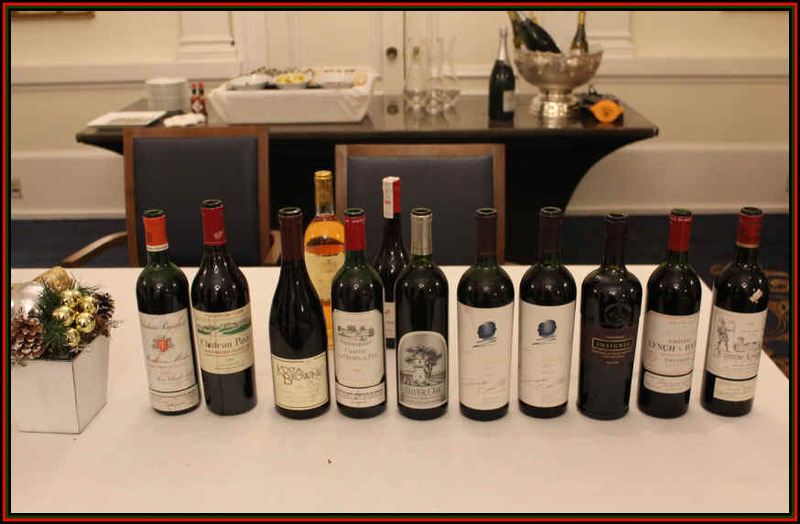 The 1978 Ch�teau LaGrange was a good example of "old" Bordeaux...some tobacco notes dominated the nose and palate...medium-bodied, elegant and more than ready-to-drink, but still in good condition. 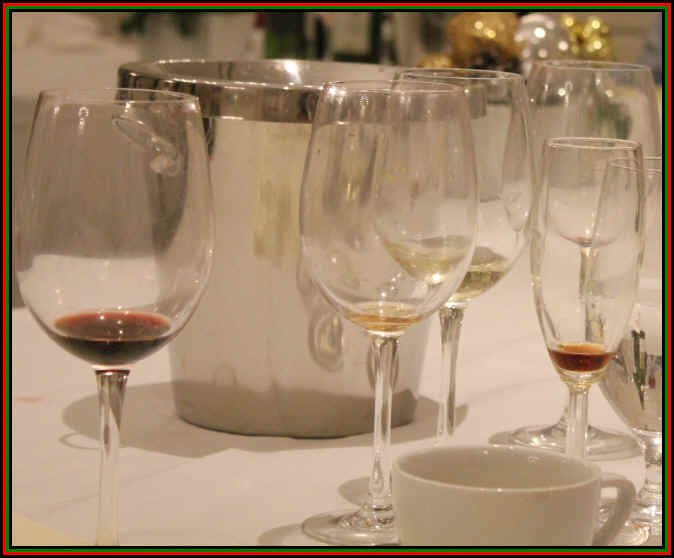 We enjoyed two dessert wines...the first was a 1999 Ch�teau Suduiraut...a nicely mature Sauternes with loads of honey notes. 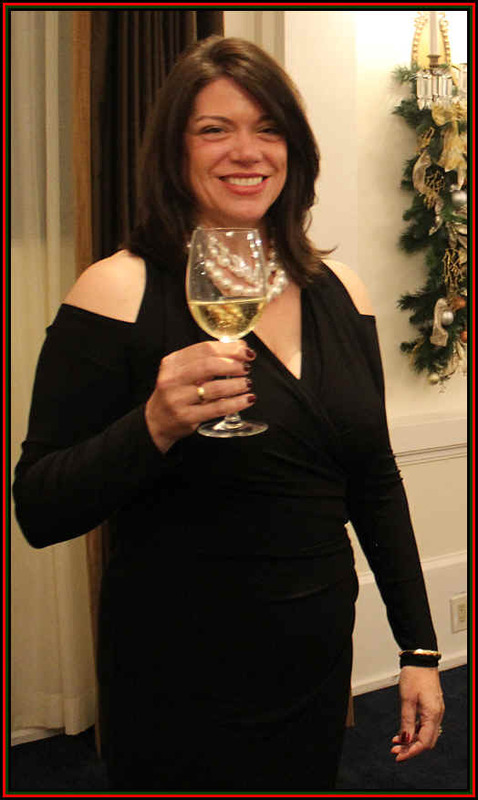 It's sweet, to be sure, but has ample acidity to keep the wine balanced. 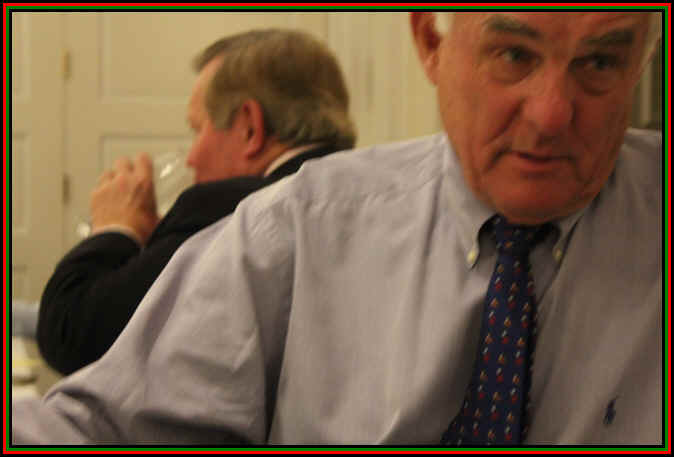 A B�che de No�l was exceptional. 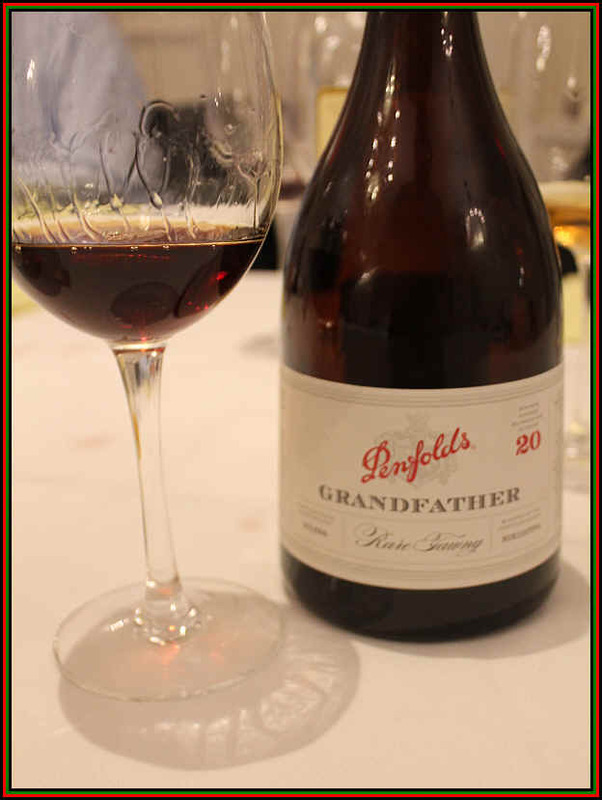 Accompanying the dessert was Penfolds Grandfather Tawny Reserve...they used to call it "Port," but these days the label has changed. It's said the solera from which this comes averages about 20 years of age. 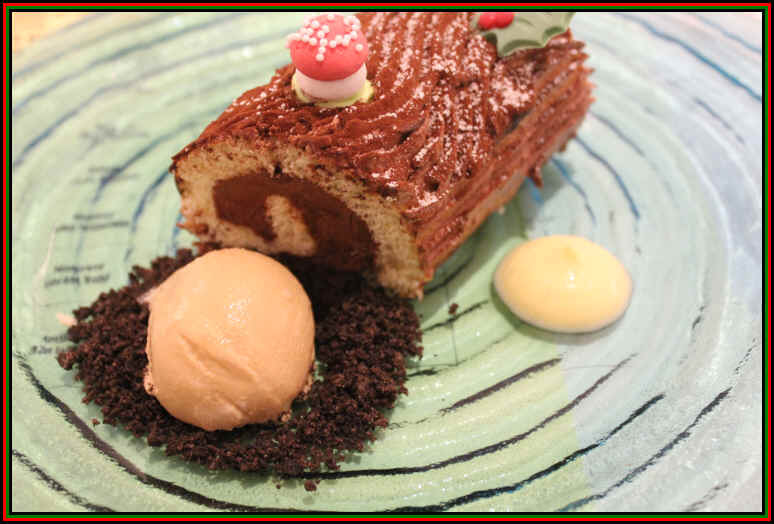 It's a delicious dessert wine and paired perfectly with the chocolaty decadence we enjoyed as dessert. And having nearly emptied all the glasses, we packed up and trundled out on to the street to take BART back home.